A teenager comes into possession of a book that allows him to decide the fate of anyone whose name he writes in its pages. It's unlikely that a movie directed by Steven Spielberg, Quentin Tarantino or Christopher Nolan will ever debut on Netflix. With the top names in filmmaking out of contention, the streaming giants have instead courted cult directors who bring with them a more modest but conveniently ready-made audience. Already this year we've seen Bong Joon Ho's Okja, with movies directed by the likes of David Ayer, Noah Baumbach and Duncan Jones set to premiere on the platform in the coming months. The latest cult filmmaker to trade a big screen release for a smartphone screen is The Guest and You're Next director Adam Wingard. Based on a Japanese manga series, Death Note tells the story of Light Turner (Nat Wolff), a high schooler who comes into possession of the titular book. As explained by Ryuk (Willem Dafoe), a Rawhead Rex lookalike demon who appears only to Light, the book gives its owner the power to decide the fate of anyone whose name is written in its pages, providing their face is also known to the holder of the book. Light tries it out by scrawling the name of his school's resident bully, and just as written, the boy is decapitated in what appears to be a freak accident. When Light lets cheerleader and object of his affections Mia (Margaret Qualley) in on his newfound power, rather than running a mile, she jumps his bones and together the two become armchair vigilantes, offing criminals and wrong-doers from the safety of their bedrooms under the adopted pseudonym of 'Kira'. Kira becomes a much loved worldwide sensation, but a mysterious detective known only as 'L' (Lakeith Stanfield) is determined to unveil Light's identity. Light also finds Mia becoming increasingly drunk on her power and willing to take the lives of innocents to protect their secret. With a downtrodden teen suddenly imbued with powers beyond his imagination, the setup of Death Note is essentially a horror riff on the Spider-Man story. As this year's surprisingly enjoyable Spider-Man: Homecoming proved, such narratives work best when kept to an intimate and local setting. Death Note ramps up its story to a global scale long before we've gotten a grasp on who exactly Light is. The film can't seem to decide if he's its hero or villain, not because it wants to keep this idea ambiguous, but because the character is simply underdeveloped. Ryuk's presence is largely pointless here. It's a surprise every time he appears, as it's easy to forget he's part of the film, and when he does it's simply to deliver a convenient piece of exposition or to establish a new rule necessary for the story to move forward. This gives the impression of screenwriters simply making things up as they go, inventing another rule to get themselves out of jail whenever the premise backs the story into a corner. 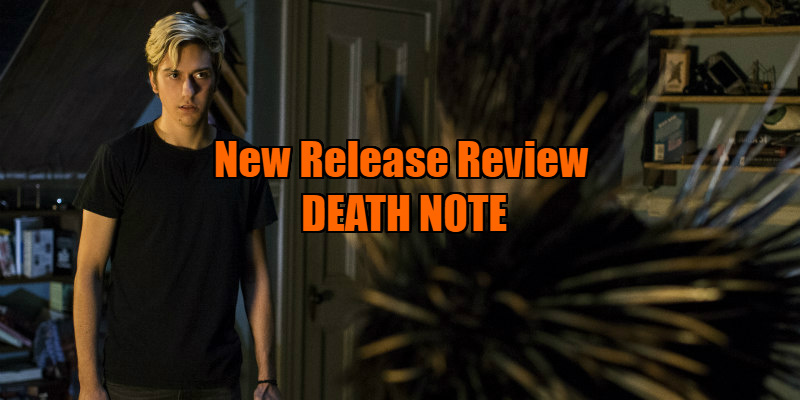 With You're Next and The Guest, Wingard proved himself capable of captivating visual storytelling, but with his regular co-writer Simon Barrett absent here, Death Note has the talky blandness of a TV pilot. Gone also are the spot-on needle drops we associate with Wingard, replaced with lyrically on-the-nose music choices that come off as unintentionally cheesy, none more so than a climactic sequence accompanied by the warblings of Jennifer Rush. 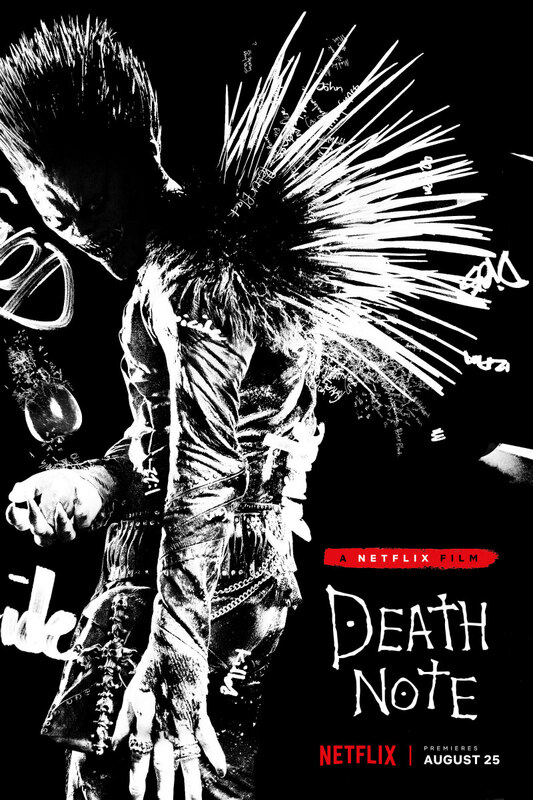 Aesthetically, Death Note has the look of those teen horrors that were so popular at the turn of the century, and early on it hints at a premise that could become the Final Destination replacement horror fans have been crying out for. The first killing, with its outrageous ladder decapitation, is the highlight of a movie that sadly never returns to such grand guignol stylings. What should have been a high concept horror movie is instead a drab detective story, one which can't decide if it wants us to root for Holmes or Moriarty. The wait for that first great Netflix movie continues. Death Note is on Netflix now.